April 8, lunch. 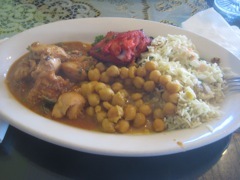 Indian Buffet in Tucson. Amrutha, Cuisine of India. A little hole-in-the-wall at the same place we get our cell phones fixed (Blue Ridge Wireless). Not amazingly fantastic, but reasonably authentic even if they have made amends for US dietary preferences. I'd go back. 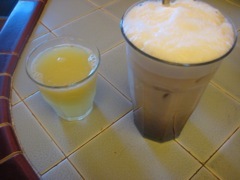 April 9, breakfast. The usual. And Wanda. April 9, lunch. 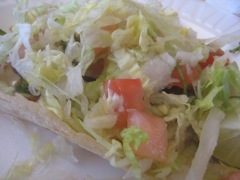 At Nico's, a fish taco. Good! 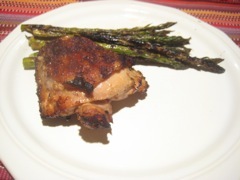 April 9, dinner. 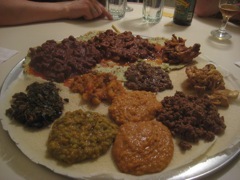 Ethiopian with Jan, Rose & Mark at Zemam's in Tucson. What can I say about this standard? I am at a loss for words. 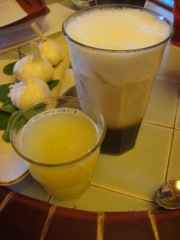 April 10, breakfast. The usual. April 10, lunch. 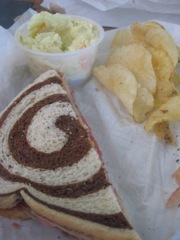 At Sausage Deli in Tucson, a Prosciutto Ham Lunch Special "as it is on the menu" (with champagne honey mustard and cheese, hot) including potato salad and chips. Food you can't argue with! April 10, dinner. At Casa Vicente, in Tucson. 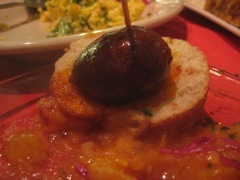 This was just one of them, the chorizo in cidro (chorizo sausage in cider), but the others were all out of focus and dark. I guess I need a tripod for meals like this. But it was tasty! With Danny and Maryann after the girls football game. 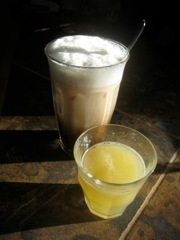 April 11, breakfast. The usual. April 11, snack. 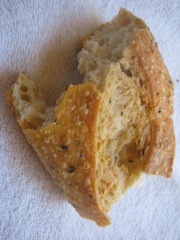 A piece of bread from Beyond Bread. Tasty! April 11, lunch. 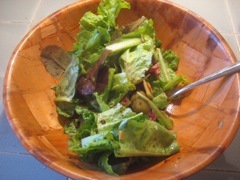 Salad of fresh greens from Jan's garden, olives, salami, and other goodies. At home with Jan.
April 11, dinner. 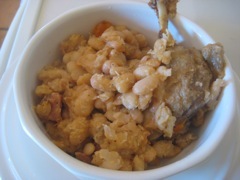 Cassoulet!!! Sunday night with the family, I made this using duck leg confit, garlic sausage, duck sausage, ventrèche, veal demi glace, and duck fat. Plus some white beans from the grocery down the road. Wow delicious yum! For the last nights of winter, a great meal. The family (Jan, Dale, Don & Barbara, Janet) and Rose came over as well. 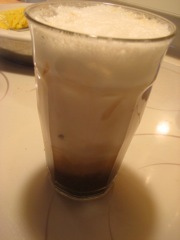 April 11, dessert. 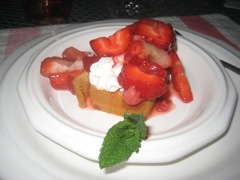 Strawberries are starting to come in, so Barbara brought some with short cake, whipped cream, and a bit of mint! 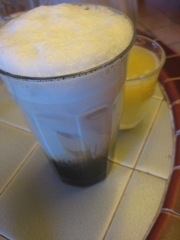 April 12, breakfast. The usual. April 12, lunch. 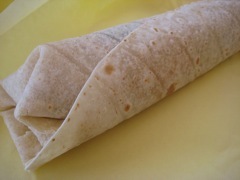 Burrito Chile Relleno from Nico's. Average. But not bad. April 12, dinner. 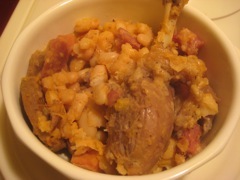 Leftover Cassoulet. Yum! April 13, breakfast. The usual. April 13, snack. Some of these little Israeli cheese puffs that Ehud gave me. These are good! Really good, actually. Fortunately, I only got one bag! 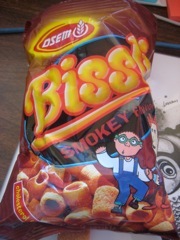 Osem "Bissli" in Smokey Flavor. I'm not sure why it's written in English. April 13, lunch. 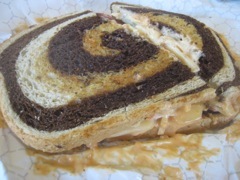 Almost Reuben from Baggins in Tucson. Good. Messy. April 13, snack. 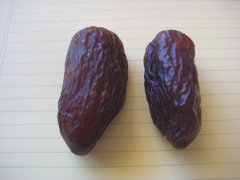 Two dates. Dale gave me these for my birthday. Delicious. 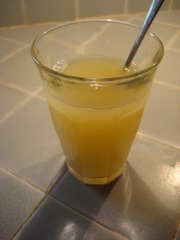 Medjool. April 13, dinner. Jan BBQed chicken, delicious! 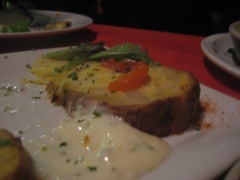 And asparagus. Great to have a cook in the house! 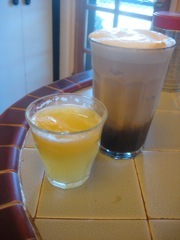 April 13, dessert. 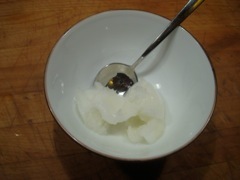 Lemon sorbet. 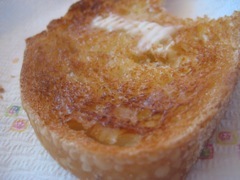 April 14, breakfast. The usual. April 14, lunch. 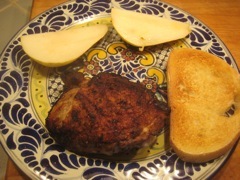 Leftover BBQ chicken from Jan, some pear, and a bit of bread. Lovely. April 14, dinner. 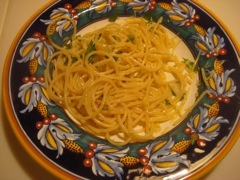 Joel's spaghetti Aglio e Olio. Simple, easy, fast, done! 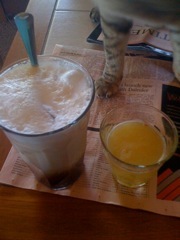 April 15, breakfast. The usual, for tax day. April 15, lunch. 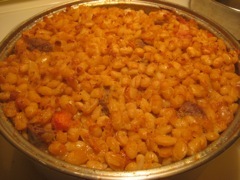 Leftover cassoulet, Joel's creation. Yum. April 15, dinner. 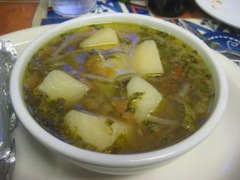 Soup from the freezer, potato and meat broth. Jan's creation. April 16, breakfast. The usual.